If you like Pina Coladas, you'll love this cake. It's a good party cake without being overly sweet. Yummy! - Prepare pudding as per directions on box, set aside in fridge. - Bake cake as per directions on box, in 9x13 pan. - Prepare topping by creaming together cream cheese and icing sugar, then adding in pudding and pineapple. 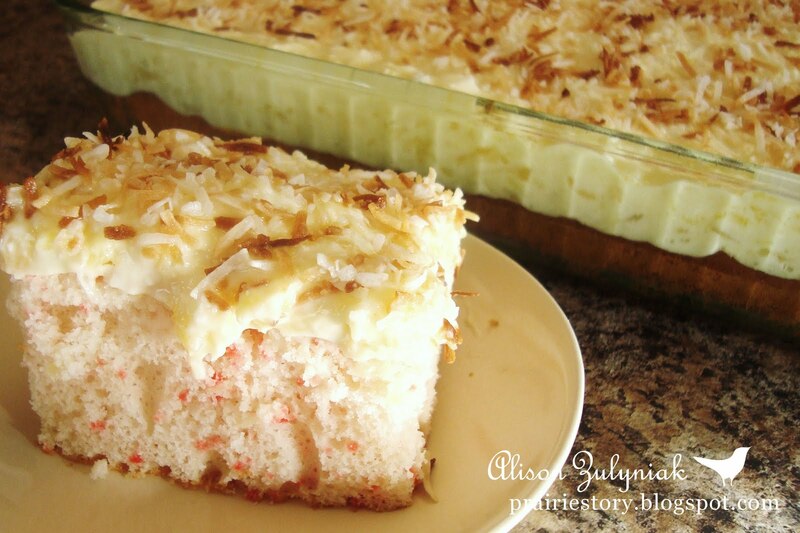 - Once cake has cooled, cover with topping and sprinkle toasted coconut on top. This looks so good and easy too, I love that! Yum- a pina colada in a cake- how awesome is that! What a cool idea! I'd never thought of using pudding in an icing! That does look good. Very moist. Thanks for sharing it (though now I have that song in my head!). What a fantastic idea! This is a MUST TRY! An easy to prepare but yummy summery dessert! Love the frosting recipe! Pina Colada in cake form?! What am I missing! @Anonymous You can use either water (as per box) or milk. I prefer milk because it makes the cake it a little richer and moister. Thanks for pointing this out. I'll update and clarify on the post! This looks wonderful! You cannot go wrong with coconut.